Taste test: These kettle-cooked potato chips were very crunchy, and they had a good helping of potato taste, with no taste that we could notice sacraficed in the name of having less fat. I think they could have benefited a bit from having more salt on them, but these were still praised nearly universally but our tasters, who quickly ate their way through this large bag. 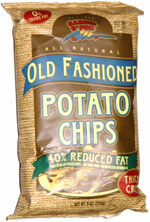 Smell test: The usual smell of kettle-cooked potato chips, potaotey but somewhat oily.